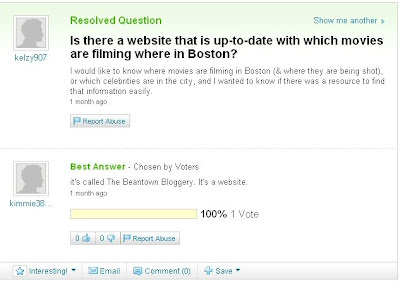 The Beantown Bloggery: Who's Got Info On Boston Movie Filming? Me! So the other day, I was googling myself to see check out who was linking to this blog. I stumbled across a page in Yahoo Answers that put a smile on my face. Many thanks to kimmie38382000 whoever and wherever you are! It's readers like you and all the other folks that come to the site frequently that make blogging worthwhile - cause let me tell you, it's not the $3 a day I make off advertising. That barely covers the cost of all my newspaper/magazine subscriptions. Click (here) for a link to the Yahoo Answers! site. 1 Response to "Who's Got Info On Boston Movie Filming? Me!" I am also a blogger and you have definitely found a nice niche with this whole Hollywood East.